It was a long plane ride. I managed to snooze between movies. Thankful I'd brought my noise cancellation headphones. I was glad to arrive at the beautiful campus of University of Queensland on the afternoon of Tuesday January 12th. The hot weather, bright sunshine and an iced mocacino with my colleagues gave me just the lift I needed. A stimulating discussion on the topic of my pet clinical passion - intensive aphasia therapy - relieved me of the apprehension that my brain had switched off during the seemingly never ending flight and too much TV. Thanks, Renee! And guess what...!? Renee's step sister is doing the full circumnavigation Clipper Race (on rival boat PSP)! Small world. Then off to the hotel, dumped my bags and went for a long walk. I love cities with rivers running through them. Brisbane's river water front is beautifully developed. The recreation trails are well tended and well used. I ended up having a lovely fish dinner on the south shore. 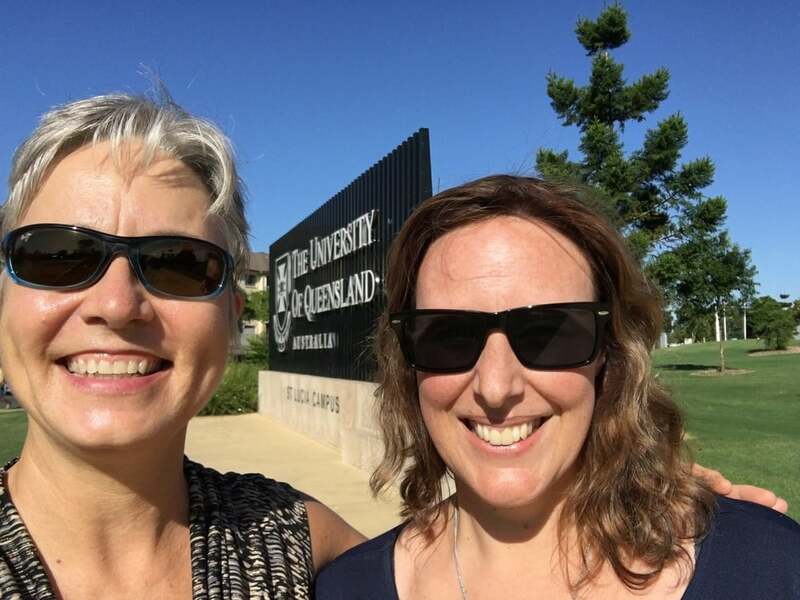 Today, the 13th, it was back to UQ to learn about the Telerehabilitation Clinic under development there. It's good to know that research is showing that "in home" therapy delivered via telepractice is not inferior to face-to-face when structured appropriately, and brings many additional benefits. Interesting to think about how telepractice might be able to extend service not only in rural communities in countries like Canada and Australia, but also in countries with developing health systems. Developments in communication technology is opening doors everywhere. After taking full advantage of the excellent wifi at the UQ campus to take care of some personal business, I couldn't wait to get out on the water. Hopped on the City Cat for a lovely long trip up and down the river that winds through the centre of Brisbane. On a whim I hopped off at the Riverside district for a delicious soft crab "burger" and glass of Aussie Sauvignon Blanc. Yummy! On the water with a breeze in the air - a great way to spend a steaming hot afternoon! Tomorrow I fly to Airlie Beach, where I will meet up with my team. Can't wait! Newer PostNo turning back now!